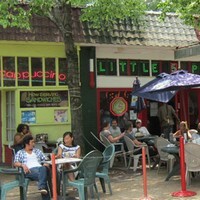 The Little Five Points commercial district is located on Moreland Avenue and Euclid Avenue. L5P is home to more than 100 independently owned and operated restaurants, shops, theaters, live music venues and neighborhood services. Parking: Some businesses located on Moreland Avenue have free parking, and street parking is also available on Euclid Avenue. MARTA: Take the Blue or Green Line to the Inman Park-Reynoldstown or Edgewood-Candler Park station. From Inman Park-Reynoldstown, head northeast on DeKalb Avenue toward Moreland Avenue NE, and turn left. From Edgewood-Candler Park, head west on DeKalb Avenue toward Moreland Avenue NE, and turn right. The Little Five Points area (at Euclid Ave. NE) will be three blocks ahead.